The first paramedic at the scene where a man was trampled to death by a herd of cows and another man injured, has described it as "chaotic". The two men were walking their dogs through a field near Bradford-on-Avon when they were crushed by the animals. One man, in his 60s, was pronounced dead at the scene while the other man was airlifted to Frenchay Hospital in Bristol with serious injuries. A police spokesman said the man remains in hospital in a "stable condition". The emergency services were called to a field in Turleigh at about 12:30 BST on Monday. Ross Culligan, a paramedic with Wiltshire Air Ambulance, described the scene as "chaotic". "We were faced with two critically injured patients and we had to very swiftly decide which one we'd have to [deal] with first," he said. "But thankfully one of the farmers, who was also on the scene, had moved the herd of cattle and left a field open exactly next to where the patients were for us to land in. "So we weren't posed with any landing issues." A police spokesman said the injured man was being treated for a punctured lung and broken ribs. 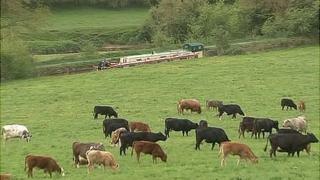 He added the cattle had been moved into a nearby field and "pose no threat to other members of the public".